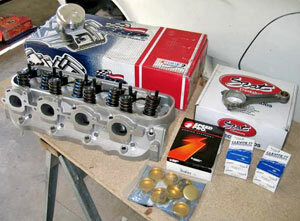 Let the engine building begin! After another trip down to the performance shop, I came home with all the major engine components needed to finally start putting the engine back together. One thing is for sure, it's nice to have all the decisions and second guessing behind me and to get back to turning wrenches. Interestingly, as part of the cam selection process the performance shop ran this engine combination through an engine simulation program. Although they know it's not exact, they feel it will serve as a reasonable estimate of how much power to expect out of the engine when it's complete. 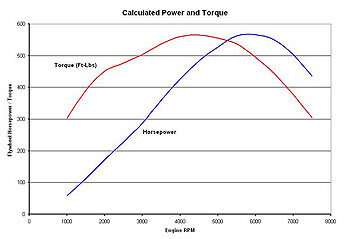 It'll be real interesting to see how their simulation compares to the actual dyno runs I've got planned. Based on the simulation, and assuming a 15% drivetrain loss, I figure I'll be somewhere around 480 horsepower and 485 ft-lbs torque at the rear wheels. Should be a lot of fun to drive, that's for sure! Anyway, shortly after my last update I finished painting the block so everything was ready to go when I came back with he new parts. In the end it took four coats of the POR-15 engine paint (more than I would have thought), but it came out looking real nice so I'm pleased. Time for some assembly! So here are a few of the new parts, I definitely have plenty of work ahead of me! For now I'll start with the pistons. Just some of the parts needed to complete the job. 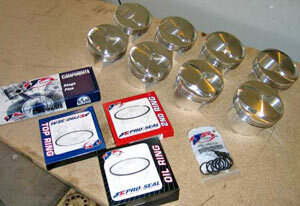 When it came to piston choice I decided on forged aluminum dome tops. I probably could have gone with hyperutectic pistons, but I've heard enough horror stories about broken ring lands and such to make me think twice about using them. 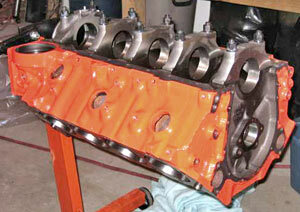 I decided to play it safe and go with a more durable, although slightly more expensive, set of forged pistons. 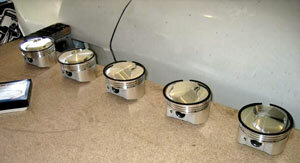 When choosing the pistons I had already decided on the AFR heads and knew they had 119cc combustion chambers. Based on that, and knowing that I wanted the car to run on pump gas, I chose to go with 26cc dome pistons. This will put my compression ratio right around 10.3:1 which will allow me to make great power while still running on pump fuel. First on the to-do list was to file fit the piston rings. The compression rings come from the factory longer than needed so that they can be custom fit to each cylinder - a very important step. 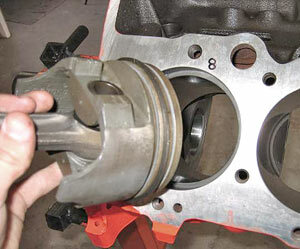 If the piston ring end gap is too large combustion gasses will escape into the crankcase resulting in lost power. If the eng gap is too small the ends of the rings will touch when the engine heats up resulting in scored cylinder walls and lots of other problems you don't want. Filing the rings is pretty a straightforward process and using a smooth flat file clamped in a vice makes the job pretty easy. 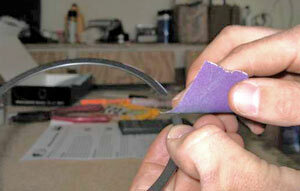 Note that ring filing must always be done with the outer ring edge as the leading edge. In other words, always file by moving the ring right to left in the above photo. 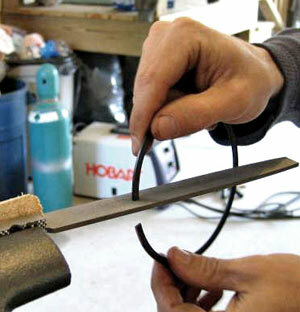 Having the outer face of the ring as the leading edge reduces the chance of chipping of the moly coating on the rings outer face. After a few passes on the file I would take the ring back to the block and check for fit. 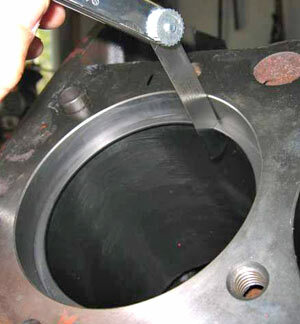 Knowing that setting the ring evenly in the cylinder is very important in getting accurate end gap measurements, I used one of my old piston and ring assemblies to simplify the process. The flat piston top ensured the ring was set true in the cylinder while the old ring served as a depth gauge only allowing the new ring to be pushed about 3/4" into the cylinder - perfect for measuring! As you've probably seen in several of the photos I numbered each cylinder and piston before starting the ring filing. 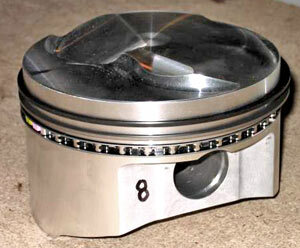 This made figuring out which piston & ring set went with each cylinder pretty much fool proof. As I finished filing each ring I set it with its respective piston on my wok bench. 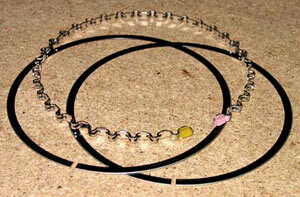 Once the complete top set of rings were complete I then moved onto the bottom ring set. My top and bottom rings were different so I had to be careful not to get them confused. In my case the bottom rings came from the factory marked with a red stripe so keeping them separate wasn't too tough. After all the filing was complete, and after all the end gaps were double checked, I used a piece of fine grit sandpaper to lightly deburr the end of each ring. A light touch with fine grit sandpaper is all that's needed. After several hours of work here's the last one - piston number eight with all three rings installed. Since this was my stopping point for the weekend I decided to store each piston in it's respective cylinder, I figure it's a pretty safe place for them. At least this way they can't be knocked off my work bench somehow. Plus, this way everything can be covered with a single drop cloth. In the next installment, I hope to get the pistons mounted to the connecting rods and also get the crankshaft installed. There's more to come!